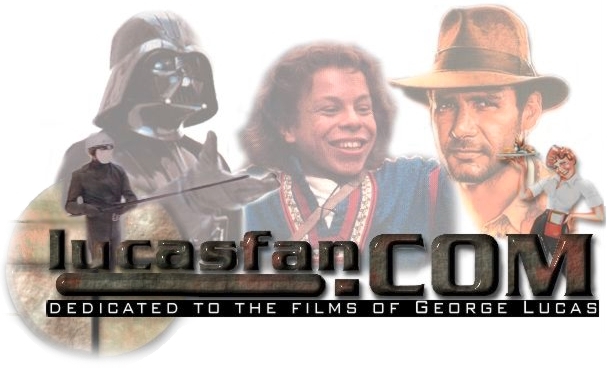 Welcome to LucasFan.com! A Resource Site for all things related to George Lucas and his films. June, 2005: Who would have thought that? Another update. Well, I wrote a book, and I wanted to put in a plug. It's not about anything related to George Lucas or Lucasfilm, but I thought that I'd mention it in case somebody who knew me when I operated this site dropped by. The book is called Nothing Lost Forever: The Films of Tom Schiller and it's about the early days of Saturday Night Live and the unreleased film Nothing Lasts Forever - a forgotten chapter in the history of SNL - as seen through the eyes of Tom Schiller. The book features my interviews with Bill Murray, Dan Aykroyd, Chevy Chase, Mike Myers, and many others... If you like movies, if you like SNL, if you like Bill Murray and the other Not Read For Primetime Players, if you like stories about Hollywood... check it out. You can get it at nothinglostforever.com or amazon.com. Check it out. November, 2003: As you have probably noticed, I haven't updated this site in a few years. The last update was made in 2001, while I haven't actively worked on the page since 1999. However, I still believe that this site is a great resource, so I will keep it online as long as I can manage. I had a great time working on this site, which originated in 1996. I spent many hours writing all sorts of content. My specialty was covering Star Wars-related television programs, and while it's a little outdated, this site is still the top source. I am particularly proud of all the interviews I conducted for the site. It is a skill that I still use today. I am very happy with what LucasFan.com has achieved, although it didn't quite reach its full potential. I don't know how many people have visited the site in total, but I do know that 100,000 people had dropped by the site in 1999. LucasFan was even featured on MTV, E!Online and MSN. So, even though it never became what I wanted it to become, I am still very happy with it. You can still e-mail me at skywalker8@lucasfan.com (just don't ask me how to get in touch with George Lucas) and you can visit my personal page at mstreeter.com to find out what I'm up to now. I didn't like the way the LucasFan main page looked before, so I made a simple Table of Contents below. The site should now be easier to navigate. Please note that some multimedia files might not be working.